﻿ Eminent Hotel, Kota Kinabalu | FROM $24 - SAVE ON AGODA! Have a question for Eminent Hotel? 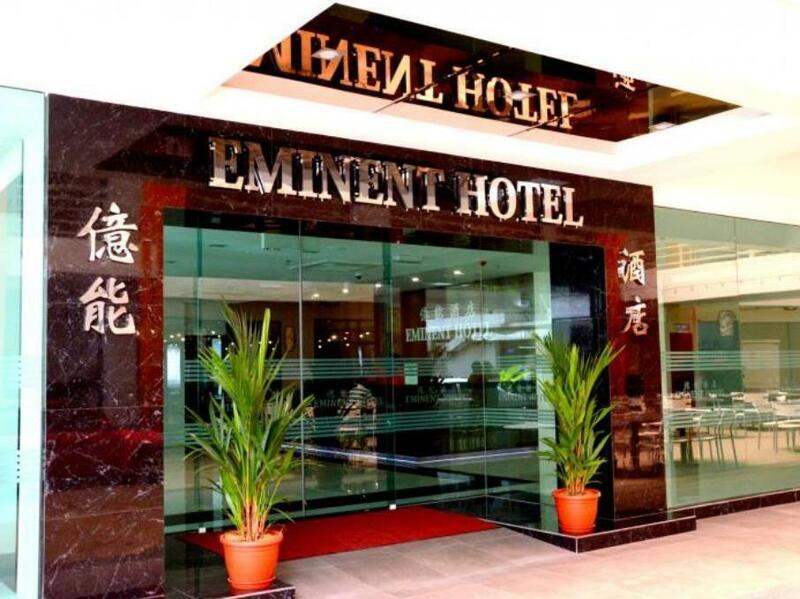 Conveniently located in Kota Kinabalu, Eminent Hotel is a great base from which to explore this vibrant city. Set from the excitement of the city, this 2-star hotel commands an excellent location and provides access to the city's biggest attractions. A well-kempt environment and its proximity to City Medical Centre, Lau And Chong Clinic, Cecilia Chong Clinic give to this hotel a special charm. 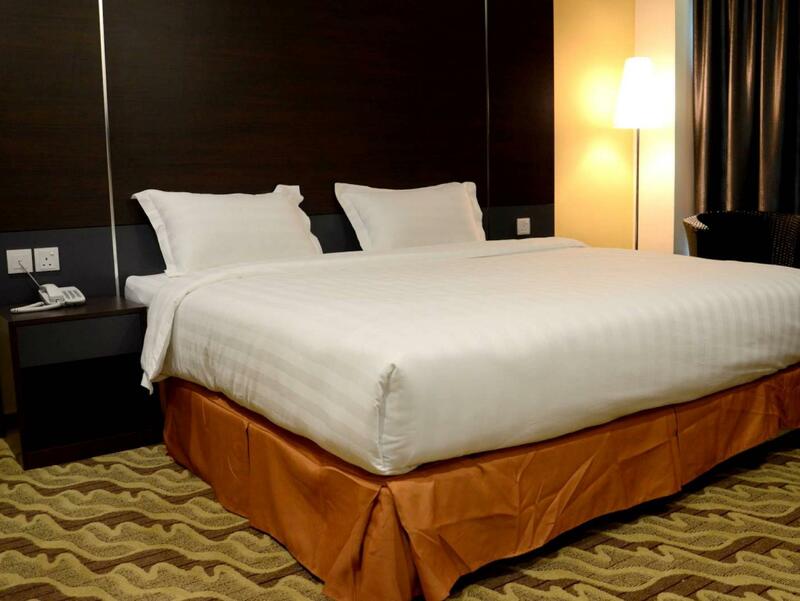 Take advantage of a wealth of unrivaled services and amenities at this Kota Kinabalu hotel. A selection of top-class facilities such as free Wi-Fi in all rooms, 24-hour front desk, luggage storage, Wi-Fi in public areas, car park can be enjoyed at the hotel. Step into one of 112 inviting rooms and escape the stresses of the day with a wide range of amenities such as television LCD/plasma screen, complimentary instant coffee, slippers, sofa, towels which can be found in some rooms. Besides, the hotel's host of recreational offerings ensures you have plenty to do during your stay. With an ideal location and facilities to match, Eminent Hotel hits the spot in many ways. 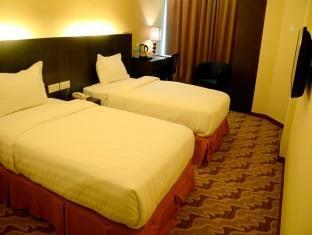 "It's a great hotel for short stay. As its in Kepayan Point,..."
The staff in this hotel were a very helpful from email support to actual maintenance of the room. The room looks great and is super clean. The sheets and pillows too looked new. Hotel is a little far from tourist spots, but there are good restaurants around this hotel. hotel near airport, nearby some restaurant and opposite highway road there's a supermarket (2min walk). housekeeping is friendly and helpful. room clean and spacious. good the hotel have smoking room. bed, blanket, bed sheet good good good. And TV channel enough to watch. Staff were nice and kind. their feedback even before the check-in were very fast. (over the internet). this hotel makes your travel to Kota kinabalu much easier with free airport pick-up service. overall, I enjoyed staying at Eminent Hotel. Room is big and spacious! I love the television positioning. Comfortable bed. Air conditioning is cold. The only problem is the location is a bit far and kind difficult to find for first timer. Would love to come again next time. Many foodies and restaurant available nearby hotel. Pros: near airport ; surrounded by restaurants, free parking Cons: no bellboy if u have many luggages; toilet door is hard to lock and very old. Toilet pipe is leaking in the middle of night and very dangerous for old people. Location is a bit out of town but for one who seeks peace and quite stay, this is it. Tour guides had no issue to locate and pickup/drop off. Will return again. No issue with food, there's two good seafood restaurants just a few steps away from the hotel lobby. A lot of locals eat there so confirm food is good and affordable. My driver used Google Maps to locate the place and there was signage outside to confirm the location. However, the lobby is somewhat hidden, so don't panic, just drive slowly and you can locate it. Opposite and across the road is CKS hypermarket,KFC, Maybank ATM, cafes, shops, On the front shop blocks are TMpoint, 24 hours laundry BubbleClean, QQ steam boat cafe, 24 hours banana leaf restaurant, nasi kuning shop, seafood restaurants. 3rd floor rooms are for non-smokers, other level rooms are for smokers. Concierge is optional. Parking spaces are limited. The Superior Twin rooms are huge, even though for 2 adults, could fit 4 adults I think. Good TV channels and receptions. Hair dryer and iron with iron board are readily available in the room. They did warned about pre-authentification of credit card payments and prefer cash deposit to respect customer privacy. Grab is available and very prompt. Sometimes, Digi reception is not very good here. Celcom is good coverage here. Very near airport and RTM. Very quiet and almost secluded place, good if you like privacy.We slept without noisy environment. Front desk can take care of your luggage s after checkout. Highly recommend. 10 minutes away from Kota Kinabalu Airport, surrounding having various of restaurant. This is my 2nd time stay in this hotel. Great stay and service. Free transport are provided from their hotel to airport upon checkout. The Hotel is a bit far to KK town but surrounding having many restaurants and foot massage center, the hotel is new and the room is very spacious. Staff are friendly and there is hotel taxi available by booking. The hotel offer free airport transfer from KK Airport to the hotel and only charge RM 15 for transferring from the hotel to KK Airport (RM 30 for midnight charges). The room was spacious, clean and cozy. Would definitely return if I drop by in KK next time. Was satisfied with room. Stayed 3 nites in superior room. Have shoplots, restaurants around and in walking distance. Staffs were friendly and smiling. Front office shud have at least a senior staff with new ones. Worth for money !!! My stay here has been great. 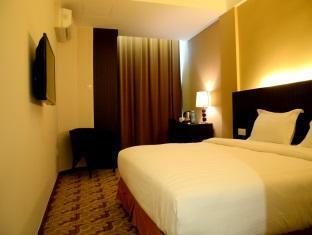 The room is big with comfortable bed. The room has nice room design. However the location is a bit far from the city centre but should not be a problem if you have a car as the place had a lot of parking space. The area has nice restaurant though. Recommended to stay. Eateries are within short walking distance. There's a pub & a karaoke nearby too. 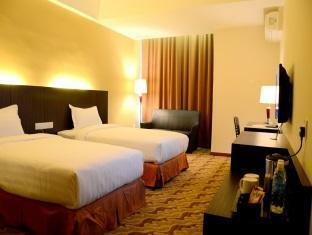 Hotel room and it's toilet is clean, bed is quite comfortable with a quiet environment. Overall my stay there was great. Will book again if I visit the area in future. Stayed here for 1 night and might stay here many nights after this. Mainly because it is a few steps away from my branch office. The hotel has 1 van and 1 car to transport you to Airport (with a fee). Difficult to get taxi because it is a local commercial site. There are 2 seafood restaurants, 1 ice-cream shop, 1 massage/spa outlet and 99 Speedmart sundry shop, just next to the hotel. Many more restaurants across the main road. This hotel is located about 10 minutes drive from airport. But around 20 minutes to Kota Kinabalu city centre. The taxi from here to city centre will cost you around RM 30 per way. This hotel just opened this year, thus the room and bathroom is very clean and neat. Room equipped with flat screen tv and coffee making facility. Like any budget hotels, room is small, but for a few night stay, it is okay.